Sophia loves biter biscuits, but this picture will give you clear reason why I don’t give them to her as often as she would like! Moms Rising has taken out the guess work, and should make Christmas shopping just a little bit easier. Healthy Toys has tested 1250 toys for common chemicals and have made their results available online. But what if you’re at the store and need that information ASAP? Well, Healthy Toys and Moms Rising have partnered to make that information available at the tip of your fingertips, literally, via your mobile phone. All you have to do is text, Healthy Toys and the toys name to 41411. For example, text, Healthy toys Elmo Flashlight , to 41411. They will reply instantly whether the toy tested “high”, “medium” or “low” for potentially dangerous toxins. Check out Moms Rising for more tips on receiving the information via your mobile phone. I received the above information via email from Moms Rising. If you like this information, then help your children and future generations by signing this petition to demand Congress to make sure our toys are safe for kids ( a no-brainer) and lead-free. Maybe you’re thinking how can one person make a change? It’s definetly worth a try! I love the show Jon & Kate plus 8. TLC had a marathon on Sunday and since it was a snowy, rainy day I watched it on and off while playing trains and doing Melissa and Doug puzzles over and over again with George. I love watching Jon & Kate, they have a great family dynamic, but selfishly, when I watch that show, I realize the chaos I experience with just 2 kids is nothing! Anyway, her husband had this great t-shirt on, “Daddy needs a time out”, which made me laugh. Anyway, the website that sells it Time Out Spot has a great idea. which I think is completely perfect (the website comes complete with Time Out instructions). I don’t know about you but my son doesn’t sit in a chair for 30 seconds, let alone 2 minutes for a time-out. The creator of the website seemed to have the same problem with her kids, hence the Time Out Spot. I brought up that idea to my husband and he doesn’t think that fact that it’s not a chair would matter, but we’ll see! I also came across this product on ABC mommy, a bib with sleeves. 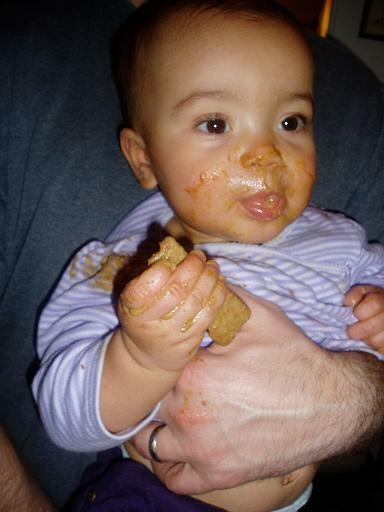 I don’t know about your kids, but my daughter, Sophia, is messier than my son was as a baby. When she eats, it is all over the place. She crushes the food with her fingers as she stuffs it in her mouth and gets food in all her crevasses. It’s pretty funny! My husband swears she just needs to wear a trash bag with a hole for her head. I stopped putting bibs on her because she just rips them off. So I let her make the mess and change her afterwards. Besides, how much bib, is too much bib? I have fallen into the baby leg warmer craze, especially now having a daughter, they are cute for boys too. But, with all the different brands of baby leg warmers out there, how do you know what brand to buy, or what’s the difference. Well, I explored 3 brands of baby leg warmers, Huggalugs, Baby Legs and Crawler Covers. First let me say, I liked all 3 brands. The most inexpensive was the Crawlers Covers at $9 a pair you really get a nice quality product. I ordered them from Etsy.com (a website devoted to buying and selling homemade items) and received free shipping. The nice thing about the leg warmers besides the great price, the cute designs (she has a lot of selections), I felt, was the fact that I was buying them from a work-at-home mom, so I knew they were made with care, with kids in mind (she is a mother of two) and made in the US. The Huggalugs are made in Australia. And the Baby legs are made in China. I loved both products, the baby legs were a little softer than the Huggalugs and if you are looking for a company with a cause Baby legs does a lot to promote AIDS awareness and suffering in Africa (they are holding an online auction on ebay). If you order direct from their website, they even have a space for you to make a donation in the amount of your choice to the Sanya Babies Home in Uganda. It’s nice to see companies give back. When it comes down to it, they all have nice products! I guess it depends on what matters most to you just the product, or what’s behind the product that counts! It’s nice to be able to get both! But now you’re back and with a vengeance. We say to you as we weep …. and waking at 1,2 and 3.
and our nights without a peep.